GisCourse.com belongs to TYC GIS Group, a consulting company which provides advising and training services in the newest GIS technologies, for individuals, companies or public organizations. Our experience and capabilities recommend us, as one of the most serious company in the business, allowing us to provide quality and up to date training services, according with the current trends experienced by each GIS related sector. At TYC GIS we offer high quality online and face to face training related to the newest trends in the GIS business. Our team of instructors consists of specialized professionals with extensive expertise in various GIS sectors and training activities. All of our courses have been acknowledged by a variety of leader organizations related to GIS business, between them the Geographic Information Systems Certification Institute (GISCI) and Royal Geographical Society (RGS). Each course award the student a number of CPD points along with a certificate. You can use the certificate as part of your portfolio and use it when attend a job or various applications interviews. The GIS Certification Institute (GISCI) is a worldwide organization that provides to the GIS community an internationally recognized and complete certification program. GISP is probably the most recognized certification in the field of GIS proving a valuable method for underlying competences between professionals and employers in the GIS profession. To be able to apply to the this certification program and become a Certified Geographic Information Systems (GIS) Professional (GISP), you need to meet the minimum requirements for the following 3 categories: educational achievement, professional experience and contribution to the profession. (*Effective July 1, 2015, all professionals applying for their initial GISP certification will be required to take and pass the GISCI Geospatial Core Technical Knowledge Exam, in addition to meeting the current standards for certification via a portfolio based review based on ethics agreement, education, experience, and professional contributions). GISCI qualifies all of TYC GIS – Giscourse.com courses as education points for either a first-time applicant or a re-certifying GISP. After the completion of each TYC GIS course, students will obtain a verified certificate that may be submitted along with the GISP application as a proof of your accomplishment of educational points. The number of points that the students will receive for the education achievement section will be determined by the number of hours of each course. The Royal Geographical Society (RGS), within the Institute of British Geographers, is the UK’s society and professional organization for geography. It is the world leader in advanced geography offering support to field related experts in the UK and also across the world. 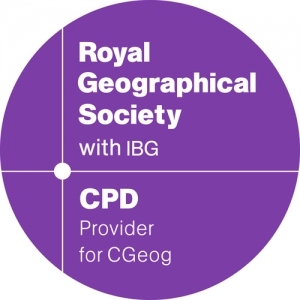 RGS offers the Chartered Geographer (CGeog) professional accreditation, the only one recognised internationally for those who can demonstrate competence and expertise in the use of geographical knowledge, which can be integrated in various related areas. RGS values learning as a continuous activity, to improve career development, therefore Continuing Professional Development (CPD), is an ongoing requirement to maintain the Chartered Geographer status. Applicants are required to demonstrate a minimum of 35 hours per year of CPD points in order to maintain their Chartered Geographer status and with TYC GIS courses that are recognized by RGS you can realize this. See our GIS course offer. We have what you need!.